You have probably seen them in the exercise section of Walmart, Target or Winners. You may have even watched someone at the local gym use one, or even through a Youtube video. But what the heck is it, and how does it work? 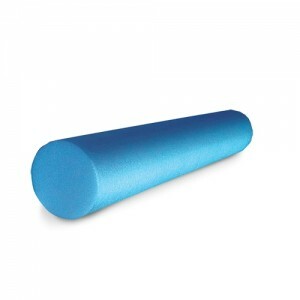 Foam rolls are typically used to release myofascial tissue on a self-directed basis. They work by using your own body weight, targeted to certain muscles or regions of the body, while you roll the location overtop of the foam cylinder. This process helps to temporarily reduce muscle tension, stretch fascia, increase circulation and will typically show an increase in range of motion and pain immediately following use. 1. Not all foam rolls are equal. They can come in many different densities, and the firmer the density, the more advanced the process. This means that beginners should start with a low density foam roll. If you advance yourself to quickly, you can aggravate existing injuries or create pain that was not there to begin with! 2. Foam rolling is not for everyone. If you suffer from circulatory disease, bleeding disorders, heart, kidney or other organ failure, skin disorders or are even taking blood thinners, foam rolling may not be right for you. As with all new physical regimes, it is best to consult your chiropractor or medical doctor first. 3. Avoid areas of extreme tenderness, tendons, ligaments and joints. Try to focus your foam rolling on muscle tissue only. 4. Try to slow down your process, and roll out tissues for up to 1 minute. Taking your time during this process will help to achieve a deeper release through the tissues. 5. Using a foam roller on your lower back can often make low back pain worse, so only use a foam roller in this area as directed by your health care provider. 6. Foam rolling is not a massage and will not release tissue and joint tension in the same manner as a chiropractor or massage therapist would. A foam roller should be an ancillary treatment tool you use to help keep the improvements that your manual therapist helps you to achieve and refine. Foam rolling helps to reduce muscle tension and temporarily increase range of motion, however it will not reduce tissue adhesions between muscle layers or surrounding joint capsules and it will not help to improve segmental joint motion. Foam rolls are available in full and half lengths at Optimum Health: Chiropractic, Massage & Fitness. Each includes a pamphlet demonstrating several exercises and stretches which can be performed using the foam roll. Don’t hesitate to ask our team should you have any questions.